The Commonwatlth Fund’s review of U.S. health care provides assessments of our non-system’s efficiency, equity, access and quality. Some good news can be found in an exception to the overall pattern of U.S. performance: rapid progress on quality metrics that have been the focus of national initiatives and public reporting efforts. Hospitals, nursing homes, and home health care agencies are showing marked improvement in patient treatment and outcomes for which data are collected and reported nationally on federal Web sites and as part of improvement campaigns. There has also been significant improvement in the control of high blood pressure, a measure that is publicly reported by health plans; increasingly, physician groups are being rewarded for improving their treatment of this and other chronic conditions. Better management of chronic diseases also has likely contributed to reductions in rates of avoidable hospitalizations for certain conditions, though rates continue to vary substantially across the country. Of great concern, access to health care significantly eroded since 2006. As of 2010, more than 81 million working-age adults—44 percent of those ages 19 to 64—were uninsured during the year or underinsured, up from 61 million (35%) in 2003. 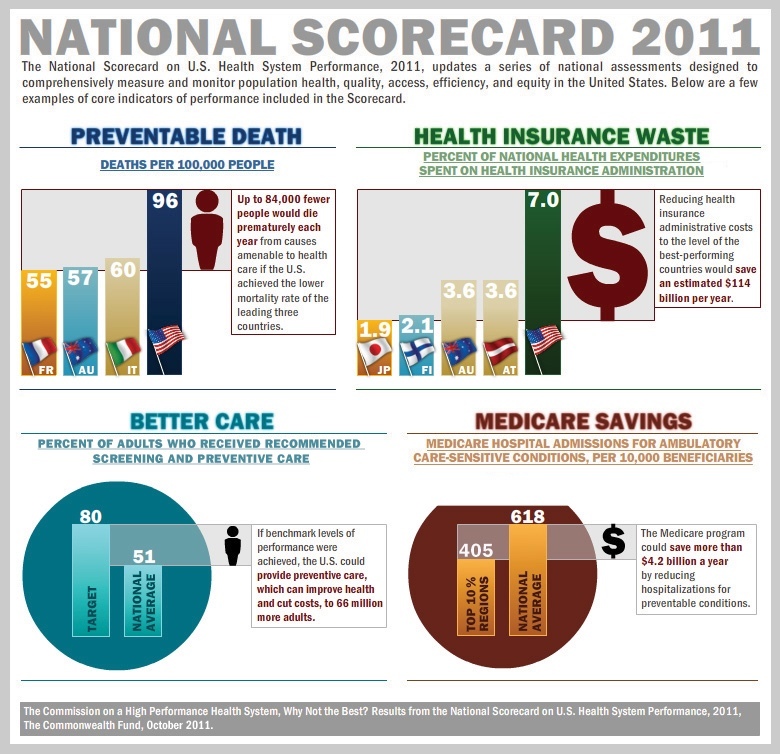 Further, the U.S. failed to keep pace with gains in health outcomes achieved by the leading countries. The U.S. ranks last out of 16 industrialized countries on a measure of mortality amenable to medical care (deaths that might have been prevented with timely and effective care), with premature death rates that are 68 percent higher than in the best-performing countries. As many as 91,000 fewer people would die prematurely if the U.S. could achieve the leading country rate. such as preventive care, adults and children with strong primary care connections, and hospital readmissions—likely stems from the nation’s weak primary care foundation and from inadequate care coordination and teamwork both across sites of care and between providers. These gaps highlight the need for a whole-system approach, in which performance is measured and providers are held accountable for performance across the continuum of care. Medicynical Note: We spend more and have worse health care. Only in the U.S.